Over the last few years there have been huge advances made in our understanding of the interactions between the brain and the gut – the enteric nervous system. 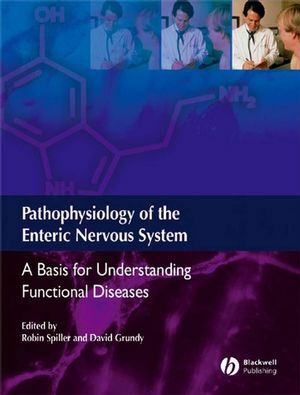 This book is particularly relevant in the understanding, diagnosis and management of irritable bowel syndrome – the most common functional disorder of the bowel. IBS has been diagnosed in 10-20% of adults in the US, and symptoms of IBS are responsible for more than 3 million visits to the physician in the US. This book is aimed at specialist gastroenterologists but also should be of interest for trainees and fellows in gastroenterology, as well as PCPs and GPs with an interest in this subject. Robin Spiller is Professor of Gastroenterology in the Wolfson Digestive Diseases Centre, University Hospital, Nottingham. He has had a long-standing interest in the pathophysiology of funtional bowel diseases particularly those arising after bouts of gastrointestinal infections. David Grundy is Professor of Biomedical Science at the Unversity of Sheffield. He has for many years pioneered the study of afferent signalling in the gut with particular interest in the mechanisms that mediate and modulate sensory signal transduction. Section D: Advances in Pharmaco Therapy.